1 1/4 width. These soft, natural bristles are great for cleaning all wood, glass, and furniture surfaces. We offer a genuine Electrolux plastic wand that will work beautifully with this attachment. 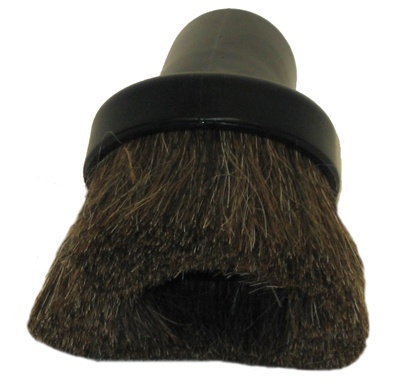 This fit the brush attachment on my Electrolux C102G canister vacuum. It works much better for dusting than the old worn out brush. My 60 + year old Electrolux is still going strong, but the duster bristles are getting a bit worn. This fits the bill, just wish the bristles were a good 1/4" longer. Ordered this for my Silverado canister. It's a great fit and a good price. Great customer service as well. Good product, nice brissles. However: Does not fit hose or want. I sawed off the hose part of the old brush, which clips into handle or wand. This brush slide-fits into it, so it can rotate as old brush did. Does NOT fit into accessory compartment of Renaissance. I wish an exact replacement were available. Answer:Yes, this will fit the ambassador model.